In the fabric of time and space...comes a new adventure. "Welcome to the next generation of Pokémon! As a rookie Pokémon Trainer, you will need to catch, train and battle Pokémon on your journey to become the Pokémon League Champion. You will face many challenges along the way, as you search for the Pokémon that rules time or space..."
The fourth generation of Pokémon games, Diamond and Pearl hit the Nintendo DS in Japan in 2006 and the rest of the world in 2007. Taking place in Sinnoh, the Pokémon world version of the Japanese island of Hokkaido, the plot is familiar territory for the series: you, a child from the modest little village of Twinleaf Town, and your hyperactive best friend, have a fateful encounter with Professor Rowan, the local authority on Pokémon, and his well-meaning but inexperienced assistant. Said encounter leaves you both with your first Pokémon, so naturally you set out To Be a Master, collecting monsters and badges and challenging/defeating opposing Trainers along the way. A third version, titled Platinum, came out a couple years down the line. Platinum tweaked the storyline a bit, adding more characters, remodeling the graphics of a few locations, revamping some gyms, and naturally including new challenges for players. Not to be confused with seasons 10 through 13 of the Pokémon animenote Pokémon: Diamond and Pearl; Pokémon: Diamond and Pearl: Battle Dimension; Pokémon: Diamond and Pearl: Galactic Battles; and Pokémon: Diamond and Pearl: Sinnoh League Victors, but Pokémon from this era do show up in the show. For the bootleg under the name "Pokemon Diamond", see Telefang. 108: Diamond version's Pokedex description of Spiritomb is "A Pokémon that was formed by 108 spirits. It is bound to a fissure in an Odd Keystone." Both its Defense and Special Defense are 108, and its Regional Pokedex number is 108, too. From these games and onward, your Bag of Holding now has a limit of 999 copies of each item instead of 99. There is a space for every item in the game, so there's no risk of your bag filling up unless you actually get at least a thousand of an item, causing the overflow to take over another item's slot. No longer will you have to put items in your PC. If you knock out a Legendary, it will return to the place you encounter it after beating the Pokémon League again. One of the apps you can get for your Pokétch is a map, which, of course, keeps track of your location without having to repeatedly go to the menu and select your other map. However, this also allows you to see where roaming Pokémon are located without having to find them for yourself first, making it way more easier to find and catch them. Adult Fear: A post-game encounter in Platinum with an elderly man who laments that he knew his grandson was living in an emotionally unhealthy home (whether it was abusive or just that severely neglectful is left to speculation), but didn't do anything to help until it was already too late to save him. It's heavily implied that his grandson is Cyrus, the Big Bad of the game. Imagine living with the guilt of knowing you could have prevented that and didn't. Always Check Behind the Chair: The Wayward Cave that contains the pseudo-legendary Gible and the Earthquake TM is located right under the Cycling Road. Apathetic Citizens: Downplayed. Most people said that Team Galactic was "up to no good". A lot of them probably didn't realize the scale of their mission, since the worst they did in public was steal a Pokémon from a kid. In Platinum, it does seem that the government is at least trying to do something by sending a detective/secret agent on their trails. Inverted in that most of Team Galactic's own members had no idea what they were actually doing and would have probably freaked out if they had known. Artificial Brilliance: Enemy trainers tend to give their Pokémon moves that can cope with their weaknesses. And yes, they will use it on you. Awesome, but Impractical: Any Rampardos using Head Smash. Head Smash is a powerful move, goes well with Rampardos sky high attack, and comes with STAB damage. However, half the damage done is dealt back to the user as recoil, and with Rampardos being such a Glass Cannon, you won't be able to use it more than once. This generation's Gym Leader lineup introduces Byron and Roark, a father and son pair who represent Canalave City and Oreburgh City. Byron is also related to the Underground Man, making them, as the game puts it, "a team of dedicated diggers"! There's also the rival, Barry, who is a plenty strong trainer in his own right, and his absurdly-tough father Palmer, the Battle Tower Tycoon. The Physical-Special split gave Waterfall a badly-needed shot in the arm. Prior to the split, Waterfall was stuck as a worse version of Surf that didn't hit multiple enemies. Starting from these games, it was made a Physical move, which brings it out from Surf's shadow and gives Water-type physical attackers a solid move to work with. It also gained the ability to make targets flinch. Several moves received power buffs in these games. Notable examples include Leaf Blade going from 70 to 90, Outrage being boosted from 90 to a massive 120, and Rock Smash being brought up from a wimpy 20 to a slightly less wimpy 40. Hypnosis received a notable accuracy buff from 60% to 70%, which was promptly undone in Platinum onward. Absorb, Mega Drain, and Giga Drain all got their PP increased by 5 (to 25, 15, and 10 respectively). Big Boo's Haunt: Lost Tower on Route 209 is the typical "resting place" type dungeon, but there is also the Old Chateau in the middle of Eterna Forest. Blackout Basement: This time the only place you need Flash is Wayward Cave, which is why it was demoted to a TM. Getting a win streak of 20 in the Battle Frontier facilities (50 in the Battle Hall) lets you fight that facility's Frontier Brain. Getting a streak of 49 (170 in the Battle Hall) lets you fight them again with a different team. In Diamond and Pearl only Tower Tycoon Palmer can be fought since the Battle Tower is the only facility available in those games. In Platinum, there is an area called the Battleground in the Survival Area where you can rematch all of the Gym Leaders with new teams and fight the Guest Star Party Members you've encountered. The P.I. Trainers are Gamblers in Japan; pay attention to how they talk about chance and how they are flipping a coin in their sprite. Their resemblance to a detective was purely coincidental. A literal translation of one of the myths you can read in the Canalave Library explicitly states that people and Pokémon used to get married to each other. The localization changed it into a metaphor about "[eating] together at the same table" to imply equality, with no mention of marriage. Hiker Alexander on Route 208. He only has one Pokémon, but it's a Level 40 Probopass with the moves Block, Thunder Wave, Sandstorm and Rock Slide. If you don't have a Fighting-type/Ground-type or a Mon equipped with a Fighting or Ground move, you'll have an extremely difficult battle on your hands due to its high bulk. There is the duo of Ace Trainers Dennis and Maya at the north entrance to Veilstone City. They use high-powered, high-level Pokémon for that point in the game (Gyarados and Driftblim in Diamond and Pearl, Lickitung and Gligar in Platinum). At this point, you'll only have two or three badges, and if you don't talk to them from the side and instead rush toward the city entrance, you have to battle both of them at once a Double Battle. Bronzor and Bronzong. Their Psychic/Steel-typing leaves them with only two weaknesses, Fire and Ground, and both of their abilities negate one of those weaknesses. If they have Heatproof they don't any extra damage from Fire, and if they have Levitate they are immune to Ground. Combined with their above-average bulk and access to several moves that inflict Standard Status Effects, they can be a handful to take down. Lucario's popularity surged to the point where it essentially became the mascot of the Generation. It got a movie focusing on it, was included in Super Smash Bros. as a playable character, and was even given a Mega Evolution in Pokémon X and Y. Among the human characters it is Cynthia and Looker to the point that subsequent games would try to feature at least one of them in. Route 210 is blocked by a group of Psyduck, which you could've defeated easily, but instead you have to get a Secret Potion because they have headaches. A man next to route 222 won't let you pass because of a blackout in Sunyshore City until after you've beaten the Big Bad. This one is at least slightly justified by the fact that not only did Volkner cause the blackout, it likely would have shut down his gym, meaning there would be little point in going to Sunyshore anyway. Random people block your way for no legitimate reason. Route 212 is blocked from the northern side, even after you've beaten Hearthome City's Gym, just to make you take a longer path. No badges, no special events, nothing. In Platinum, a battle is blocking the entrance to Canalave City if you manage to Surf there before picking up the HM from Celestic Town. After you escape from the Distortion World in Platinum, you're placed outside the entrance to Turnback Cave. Cynthia just happens to be standing in front of the entrance, and will remain standing there until you defeat her at the Pokémon League. Bubblegloop Swamp: The Great Marsh, as well as some of Route 212. When you get the Old Rod and Good Rods on Routes 218 and 209 respectively, the Fishermen will ask you if you need an explanation on how to use the rods. Even if you say no, they'll still blab on about them. When you get to the end of Iron Island and Riley offers you the Riolu egg, if you say no, he'll "insist". You have to say yes, even if you have a full party, in which case he'll wait until you come back with a free spot. In Platinum, Cynthia will stop you from going to the bike shop unless you accept the Togepi egg. When you reach Stark Mountain for the first time you encounter Buck who asks you to patrol it for some suspicious activity. If you say "No" he will continue to ask you to patrol the mountain. Captain Obvious: Daisy the Psychic: she states that she will battle you when she catches you, and that she will reluctantly give you prize money when you beat her. Both of which you would know by you encounter her, especially since you've beaten the Pokemon League as she's on the island you can only reach via beating the game. Capture the Flag: A minigame in the Underground. Cast from Hit Points: The new Life Orb item boosts the power of the holder's attacks by 30%, but every successful hit costs the user 10% of their total HP. Character Select Forcing: There are only 2 Fire-type families in the region before the post-game, the Ponyta and Chimchar lines, one of which is a starter. This had to be known by GameFreak, as they made one of the Elite Four a Fire-type user and only 2 of his Pokémon are actually Fire-type, and it doesn't actually include every Pokémon introduced in Generation IV. This was fixed in Platinum. Color Motif: Blue, pink and yellow are prominent color in several aspects of Sinnoh, ranging from the protagonists, the lake trio and the mascot Legendaries note Lucas, Azelf and Dialga (blue); Dawn, Mesprit and Palkia (pink); Barry, Uxie and Giratina (yellow). The Team Galactic admins have Pokémon at levels way before they should be available— Purugly and Skuntank at level 17 or so when neither is supposed to evolve until its 30s. The Battle Hall in Platinum prevents the player from using Pokémon below Level 30, though this doesn't stop the AI from doing so. Console Cameo: This time both playable characters and Barry have a Wii in their room. Additionally a Wii is one of the items available as a decoration in the player's Underground Secret Bases, simply called a "game system". If you're having trouble with Water-type Gym Leader Crasher Wake in Pastoria City, the nearby Great Marsh happens to have a decent selection of Grass-types you can use against him. The routes between Mt. Coronet and Snowpoint City contain a couple Fighting-types you can use for Ice-type Gym Leader Candice. Cosmic Horror Reveal: Cyrus, the Big Bad takes this Up to Eleven by attempting to destroy and re-create the entire universe as he sees fit. He does this by imprisoning three legendary Pokemon (Azelf, Uxie, and Mesprit) in order to create an object called the "Red Chain" which he then uses to summon Dialga and Palkia (who happen to be the God of Time and God of Space respectively). Cyrus then attempts to use their power to bend reality and reshape the universe in his image. In Pokemon Platinum, this causes Giratina (a ghostly dragon-god living in an alternate dimension) to become enraged and drags Cyrus into its world (a bizarre realm where the laws of physics and so forth are far beyond human understanding. Appropriately, it's called the "Distortion World"). And, once again, it's up to the player to save the day. Cutting Off the Branches: In Black and White, Cynthia refers to Dawn/Lucas fighting Giratina. Cynthia is not present for the DP Giratina fight (which is a minor optional fight in those games on top of that), implying Platinum is the canonical game. Damage Typing: These games introduced the Physical/Special split, which determine this based off the individual move rather than the Elemental RockPaperScissors chart (i.e. previously all Water moves were Special but now some aren't). Death Mountain: Mount Coronet which is by far the biggest and most complex dungeon in a Pokémon game. It is a very straightforward dungeon on your first time through, but the second and third times take you first to Sinnoh's icy northern area, then to Spear Pillar at the actual mountain top. There's also Stark Mountain in the postgame, through which you initially travel with Buck. Developers' Foresight: Has its own page here. Difficulty Spike: The Elite Four and Champion are much harder compared to the eight Sinnoh Gym Leaders, due to a sizable level difference between them and the trainers in Victory Road which may leave your team under-leveled if you didn't do any Level Grinding. Platinum fixes this somewhat by lowering their levels. Starly, the standard early game bird Com Mon, learns Wing Attack at a mere level 9. Wing Attack is a 60 base power move and Starly gets additional STAB damage from it. There is a good chance that an appropriately leveled Starly will be able to one-hit KO anything that doesn't resist it for a good ways into the game. Combine this with evolving early, and early access to a STAB that becomes stronger than Earthquake in Return, and you almost reach Game-Breaker levels before a few gyms. In Platinum, after getting the first badge and doing a little backtracking, it is possible to find a level 10 Golbat in Oreburgh Gate once you get Rock Smash. (Zubat does not normally evolve into Golbat until level 22.) Golbat evolves to the insanely fast and strong Crobat at max happiness, meaning that the player could have the final form of a three-stage family by the time they reach the second Gym. Oh, and both of Crobat's types are super effective against said Gym. And if you're really crazy and want to do everything to raise its happiness to the max, you can actually get a Crobat as low as level 11. Just after the second Gym, in Platinum only, Wayward Cave's secret area isn't blocked by boulders so you can have easy access to both Gible and the Earthquake TM easily before the third gym. Easter Egg: Both this and Fridge Horror. An Antidote (a medicine that heals the Poison status effect) can be found in a garbage can in the Dining Room of the Old Chateau. The same building is also home to some human ghosts. The implications speak for themselves. Eldritch Location: The Distortion World in Platinum where Giratina lives. It's clear that the area is not within the normal world, but within an alternate dimension where time does not flow and space does not expand. There are also a few points where the camera changes angles and the character is walking sideways or upside-down. Finally, there are some spots where the plants appear or disappear depending on where you stand. Eternal Engine: The Fuego Ironworks is a factory where Oreburgh's coal is refined into mechanical parts. As part of an optional sidequest, the player can visit Mr. Fuego who will reward with an item. Exposed to the Elements: In Diamond and Pearl, the protagonist is somehow able to survive the likes of Snowpoint City with just a t-shirt and jeans (for the boy) or a short, sleeveless dress (for the girl) and a scarf. This is averted in Platinum, where the protagonists are wearing jackets. Platinum also exaggerates and lampshades it with Maylene, who walks all the way to Snowpoint in nothing more than a leotard and sweatpants (she's even barefoot). She sneezes while explaining to the player that she's going to visit Candice, but she's otherwise suffering no ill effects for this by the time she's met in Snowpoint's Center. Eyes Always Shut: Uxie's are. Fantasy Counterpart Culture: Geographically, Sinnoh is a counterpart to Hokkaido, Japan. First Town: Twinleaf Town has the houses of the two playable characters and your rival, but Professor Rowan's Lab is found in the next town. Forced Tutorial: Annoying as always, but the really annoying part is that you can have already captured Pokémon by the time it is given and your tutorial giver makes no mention of it. There have been reports of Pokémon straight up disappearing from the PC due to unknown causes. Platinum only, and carried over to HeartGold and SoulSilver; the Acid Rain glitch will cause every weather to activate at once if a Pokémon faints to Pursuit while attempting to switch out if a weather is in play during a Player Versus Player battle. If Castform or Cherrim are sent out after the glitch has been triggered they will constantly transform due to their abilities being weather-dependent and cause the battle to softlock, requiring a restart. Gender-Equal Ensemble: This region's Gym Leaders. Four male (Roark, Byron, Crasher Wake, Volkner) and four female (Gardenia, Fantina, Maylene, Candice). Gravity Screw: The Distortion World in Platinum has various sections where the gravity will shift. Guest-Star Party Member: There are 5 trainers you can team up with over the course of the game. They'll accompany you through the area you meet them up in, participating in Tag Battles with you against other trainers and Random Encounters and healing your team after every battle. You can also team up with them in the Battle Tower (all games) and fight them in the Battleground (Platinum only), but only if you've traveled with them to the end of their area. There's a trick to make the same Mon pop up repeatedly while using the Poké Radar and (eventually) increase the likelihood of a Shiny appearing. Naturally, neither trick is alluded to anywhere in-game and isn't even mentioned in official guides. Getting Spiritomb involves several steps that the game never tells you about. You have to put the Odd Keystone in the Hallowed Tower at Route 209, talk with 32 other players in the Underground, and come back to the Hallowed Tower to find Spiritomb. "As we skiers like to say, 'spur thing!'" Also, from a Birdkeeper with a Noctowl: "We'll show you 'owl' best!" Inn Between the Worlds: You know that one inn in Canalave with the worn-out sign and the perpetually locked door? If you get a certain item made available via Nintendo Event (or hack it into your game with a cheating device), you'll be able to enter, being told that you have a reservation. The innkeeper seems quite suspicious, and after you go to sleep, you'll be plagued with nightmares similar to what Sailor Eldritch's son had in the Cresselia quest and either wake up on Newmoon Island or travel there in the nightmare; it's a bit ambiguous. Darkrai can be found there, and after you catch or defeat it, you'll travel back to the inn, where the innkeeper is nowhere to be found; it's somewhat implied that the innkeeper was Darkrai. Interspecies Romance: In the Japanese version, one of the Sinnoh stories found in the Canalave Library says humans and Pokémon used to marry each other. In-Universe Game Clock: Made use of the Nintendo DS's internal clock in a similar manner to how the second generation of games used a clock built into the cartridge, and future DS games kept that feature. Kubrick Stare: Cyrus does this (to the 4th wall most likely) near the end of the intro to Platnium. This set of games has small, but noticeable, wait times everywhere, including 15 second save times. There's also considerable lag in battles between animations, even with the animations off. Fixed in Platinum. Diamond and Pearl may give you a message when you save that it's "saving a lot of data," which means it will take about three times as long to load. This caused by the Box System. If you catch a Pokémon and it's sent to the box, prepare to take a while to save. If you look at the Box System for one second and don't even bother touching anything, prepare to take a long while to save. If you go hours on your journey without bothering to mess with the Box System, you'll save in a few seconds. This is because doing anything with the boxes triggers a flag that causes the game to calculate the checksums of all boxed Pokémon data on the next save, to make sure nothing got corrupted. It's a good programming practice taken into overdrive. Lethal Lava Land: Stark Mountain in Platinum. Being an active volcano it has pools of lava and is home to the legendary Pokémon Heatran. Lost Woods: Eterna Forest is a natural maze with its thick trees. On your first visit you team up with a trainer named Cheryl and every battle is fought as a double battle. If you want the TM for Explosion, you have to play the slots in the Game Corner. Not just to grind for enough coins, but to trigger TEN straight bonus rounds, and your chain can be broken simply due to bad luck. This is made even worse in international versions of Platinum, since due to the fact that the slots have been disabled, the TM is just given out at random. Super Contests, most of all the Acting Competition since bonus points are awarded based on how few other Pokémon choose the same judge. The Visual Competition, though primarily dependent on Poffin feeding, also depends on what theme you get since the opponents choose the same accessories every time (and which accessories correspond to which theme are not always intuitive). The only part that isn't particularly luck-based is the Dance Competition, which can possibly make up for lost ground in the other two sections. The 5-Maid Knockout Exact-Turn Attack Challenge in Platinum pits you against a series of five Maids, all of whom have a single Clefairy. In order to beat the challenge, you have to defeat all five in a randomly-determined number of turns — no more, no less. Sounds easy, right? Unfortunately, every single Clefairy has access to moves like Endure or Bounce that they can use to stall for time. Even with the most powerful party capable of single-handedly wiping the floor with the Elite Four, if your opponents use those moves often enough, you fail. Of course, your only reward for beating the challenge is another battle against someone who has a Blissey (though they shell out plenty of cash and you can steal a Rare Candy from the Blissey, if you're so inclined). If you want to find extra Reaper Cloths beyond the ones normally found as part of play, you have to go back to Turnback Cave after catching Giratina and successfully find all three pillars in only three moves. The rooms are randomly generated, and a reliable way to predict the correct way to go from each room has yet to be found. Considering that the Reaper Cloth's one use (evolving Dusclops into Dusknoir) isn't seen as all that useful beyond filling out a spot in the Pokédex and you already get one for free, most players don't even bother. Magikarp Power: Combee starts off knowing three moves and its stats are lousy. Also its ability is only useful for producing Vendor Trash. But if you can get your hands on an elusive female and raise her up to level 21, you'll have yourself a Vespiquen, a combination of a bee and a battleship with a touch of European royalty. Not only are her stats better, but she has a much wider variety of attacks to choose from and has three signature moves each revolving around controlling swarms of Combee and has good abilities to choose from. Mascot Mook: Dialga for Diamond, Palkia for Pearl, and Giratina for Platinum. Metal Slime: Beldum. It can only be found as a swarm Pokémon, meaning it can only be encountered for one day at a time after beating the game and it can potentially take weeks before a Beldum swarm shows up. Beldum has a catch rate on par with most legendaries, which means an extremely low likelihood of catching it even if it's at 1 HP and asleep/paralyzed. It also only appears in a route with a perpetual sandstorm that whittles down your Pokémon's HP unless it's a Steel, Rock, or Ground-type. If that's not all, Beldum's only move learned naturally is Take Down, which damages the user every time it's used. You can block Take Down with a Ghost-type, but there are no Ghost-types immune to sandstorm damage in those games, meaning you have to waste a turn healing every now and then. And if you don't catch it before it runs out of uses for Take Down, it can damage itself with Struggle. It's worth it, though - Beldum eventually evolves into the extremely powerful Metagross. Three Trainers from the Pokémon: Jirachi: Wish Maker and Pokémon: Destiny Deoxys movies appear as Ace Trainers in the Battle Zone. Butler and Diane from movie 6 appear on Route 229, the two of them sharing four of the Pokémon Butler owned in the movie. Rebecca (named "Hitomi" in Japan) from movie 7 appears on Route 224 with her Metagross. The English translation team did not notice this Easter Egg however, as Butler and Diane are renamed "Felix" and "Dana", respectively, and Rebecca/Hitomi is renamed "Jamie" instead. Diamond and Pearl open up with a TV documentary about a sighting of a red Gyarados. One of the guards in the houses connecting routes will complain about his thirst. Luckily, he's not on duty, so he can't stall your progress. Hypnosis' accuracy was reduced to 60% in Platinum after Diamond and Pearl increased it to 70%. A quite cruel, but hilarious one happens to poor ol' Regigigas in Platinum. In Diamond and Pearl, this legendary is level 70, but in Platinum, the legendary is Level 1. That's right, the big Daddy of Golems starts with the level of an infant Pokemon. Surf, one of the best Water-type moves in Generation III, was nerfed by no longer avoiding your ally in Double Battles. Never Recycle a Building: The Old Chateau was abandoned several decades ago (at least), yet still stands more or less untouched since it was vacated despite being literally on Eterna City's doorstep. This probably has something to do with the fact that it became overrun with Ghost Pokémon at some point. Noob Cave: Oreburgh Gate. It is just a straightforward cave on the first visit with only two trainers. Of course the cave is deeper than that but HM's are needed to explore further. Obvious Beta: The battles take a long time even with the animations off and saving takes a while. This is despite the fact that the Nintendo DS was much more powerful than the Gameboy Advance, so these games shouldn't have been that taxing on the newer system due to how simplistic they are in comparison to something like Super Mario 64 DS. Fixed by Platinum, though. Dual-Slot Mode allows you to encounter Pokémon that normally don't show up in the wild (like Gengar) by having a copy of one of the Gen III games in the bottom slot of the DS. This only works when played on the original Nintendo DS or DS Lite, since the DSi onward lacked the slot for Game Paks. The Pal Park feature allow the player to transfer Pokémon from the third generation by inserting one of the games in the GBA slot. By completing Pokémon Battle Revolution, the player can receive a Pikachu that knows Surf via Mystery Gift. Olympus Mons: These games take it to the logical conclusion by making the Title Legendaries Physical Gods with extreme reality-warping powers. Palmtree Panic: The Resort area counts as this because it is a beachside resort town. Pop Quiz: Hearthome's Gym in Diamond & Pearl requires you to answer basic math equations to avoid battle, which means answering them wrong if you do want to battle each trainer. Fortunately Platinum changed this gym completely eliminating the math puzzle. Port Town: There are three this time: the industrialized Canalave City, the frigid Snowpoint City, and the tourist-friendly Sunyshore City. Despite all being at opposite ends of the map, these are actually the locations of the final three gyms you'll face. Regional Redecoration: Floraroma Town used to be a desolate hill until someone expressed thanks for a blessing of nature and the entire hill burst into bloom, which is implied to have been the work of Shaymin. The evidence being that during the Oak's Letter event it turns the rocky hill both Lucas/Dawn and Professor Oak are standing into a grassy flower field after the former gives thanks for their journey, before heading off to the Flower Paradise. Rewrite: Platinum changes the circumstances of how you obtain your starter, possibly to avoid any Fridge Logic when you meet Looker, as he is searching for Pokémon thieves. note In Diamond/Pearl, you swipe your starter from Rowan's briefcase to defend yourself from a wild Starly attack, meaning you took them without permission; Rowan's comments afterward imply he only "gives" them to you because they've already imprinted on you and wouldn't work with anyone else anyway. Platinum, by contrast, has him giving them to you directly. Sequel Difficulty Drop: The post-game battle facilities. Previously, you had to make sure that all your Pokémon were at the same level (the NPCs' levels would be the same as the strongest Pokémon in your team, similar to the Stadium games), and this level had to be above the base level for all NPCs, 60. Now, you simply have to get them to at least Lv. 50, and the game will bring down any higher leveled Pokémon. The Frontier has been reduced from 7 facilities to 5, none of which have gimmicks anywhere near as frustrating as in Emerald, like the Battle Palace shunning player input so the Pokémon can attack based on their Natures, or the Battle Pyramid's Blackout Basement. Sequel Difficulty Spike: This is the point when NPCs really started taking advantage of TMs, Tutor moves, and Egg moves. Combined with the highest level curve since Gen I (which had poor AI and generally restricted move pools to naturally learned moves), Gen IV proved to be quite the challenge. Sequel Hook: Cyrus is never apprehended and is still somewhere in the Distortion World. His last lines to the player imply he'll try something again. Sequence Breaking: Once you get to Solaceon Town, you actually don't need to complete any of the towns or beat the Gym Leaders in them to progress further down the routes. The only areas blocked off here are Celestic Townnote because of Psyduck and Sunyshore Citynote because of a blackout. So, if you really wanted to, you can circle around all the way back to Hearthome City. Granted, the only reason worth doing this would be to open a shortcut to the Pokemon Mansion, or if there's a Pokemon you just want/need that much that's only available on those routes, but it is a possibility. Shared Family Quirks: The Rival, like his father, is always in a hurry and always bumps into people. Sheathe Your Sword: An interesting variation. It is perfectly possible to move the plot forward in Platinum by defeating or capturing Giratina, but you can also simply refuse to fight it by running. The game, through Cyrus being astounded at simply choosing to not fight it making Giratina come to its senses, will acknowledge this decision. Shifting Sand Land: Route 228 is a desert route with a constantly raging sandstorm. There's a Trainer in the post-game part of Victory Road that wants to judo chop you. One of the Galatic Grunts makes a reference to Sony's 2006 E3 presentation, specifically the "for massive damage" line. The lead translator was a Something Awful regular, and decided to throw in a reference to a Let's Play from the site. The female Interviewer that can be battled in the Jubilife TV station had her name was translated as "Roxy" since she uses a Wooper, after the player character from Chorocojo's run of Pokémon Crystal. The area in which the most powerful Steel Pokémon is found is called Stark Mountain. The Pokémon Rotom is clearly based on Pulseman, and one possible translation of Team Galactic's name is "Galaxy Gang". And speaking of Pulseman, a bit of the Pulseman overworld music is used in the 2nd last part of the rival's (Barry's) battle theme. On Iron Island, there is a worker named Noel who says that he is a working-class hero. Slippy-Slidey Ice World: Route 217 is covered in snow and plagued by a constant snowstorm. Snowpoint City is a snowy town, and the gym plays this straight with the typical sliding ice puzzles. The upper areas of Mt. Coronet's outdoor portion are also cold and snowy. SNK Boss: Cynthia has a powerful and well-rounded team, each member of which has a colorful assortment of move types to give a lot of super effective coverage between them. Spikes of Villainy: Team Galactic buildings have big honking spikes sticking out from their sides. Even moreso in Platinum which makes them look more detailed and streamlined. Sprite/Polygon Mix: The characters and some props are sprites while the buildings and overworld are 3D models. Suspiciously Specific Denial: The lady at the front desk of the Canalave Library, after the earthquake. "It certainly wasn't me who screamed 'Gyaaah!!' or shouted 'Help meee!!' No really, that wasn't me screaming!" Temple of Doom: The Solaceon Ruins. The player can encounter and catch Unown here and the more caught, the deeper into the ruins the player can go. Temporary Online Content: Pretty much anything involving Wi-Fi, since Nintendo had permanently shut down Nintendo Wi-Fi Connection to replace it with the Nintendo Network (which Diamond/Pearl/Platinum aren't compatible with). The Day the Music Lied: In Diamond and Pearl, Rotom uses the Legendary Battle theme . While certainly rare in every game it's available in, it has always been able to be bred (albeit only with Ditto because it lacks a gender), a sure sign of not being a legendary. The Maze: Turnback Cave is very cryptic and the player will find themselves moving around in circles constantly unless they follow a series of patterns to get through. Just always go through the door with the odd pattern of rocks. At any time going back through the door you entered will take you back to the entry room. At the end of the cave is Giratina in Diamond & Pearl and another entrance to the Distortion World in Platinum. In Diamond, Cyrus uses Dialga for his plans. In Pearl, Cyrus uses Palkia. In Platinum, he uses both until Giratina intervenes. In Diamond, the statue in Eterna City is that of Dialga, in Pearl, it is of Palkia. In Platinum, the player character can't tell which one it is, and the plaque on the statue has been torn off. Third-Person Person: Mira, one of the possible Trainers you can team up with during your journeys, will speak like this. 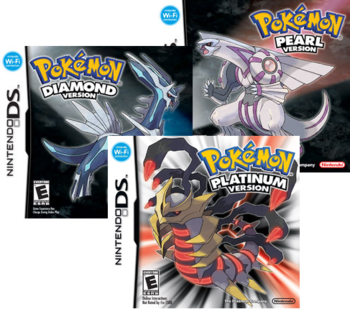 Trailers Always Spoil: All of Platinum's marketing was based around the Distortion World and Giratina's true form. Troll: A lady will trade her Haunter for a Medicham in Snowpoint City. Expect a Gengar without having to buy another game/trading with friends? Too bad. Said Haunter holds an Everstone, so it will not evolve. Even the NPC is apathetic about it. Unsound Effect: When visiting Dr. Footstep, instead of speaking, a few voiceless Pokémon will say, "Ssshhhnnn... ... Ssshhhnnn... ... Ssshhhnnn... ...", which is similar to the Japanese "sound effect" for silence. Video Game Delegation Penalty: You may choose to leave two of your Mons at the Pokémon Day Care. Pokémon in Day Care gain one experience point per every step the player takes. While its nice to have a Pokémon leveling-up while you simply walk around, there are several drawbacks to this method. For one, Pokémon in Day Care will not evolve. Two, if a Pokémon reaches a level where it can learn a new move, it will always learn that move; if the Pokemon already knows four moves, its first move will be forgotten and the new move will be placed last. This can lead to your Mons forgetting moves you wanted while learning moves you do not. Third, the Mon will not gain Effort Points as it would have if you leveled it up yourself through battle. This will leave it with somewhat lesser stats at higher levels than it would have had if you leveled it up yourself. What Measure Is a Non-Cute? : Only a handful of 'cute' Pokémon can play in Amity Square; about 11 in Diamond and Pearl and 20 in Platinum. This is actually Lampshaded by an angry Trainer who complains about not being able to take his Gyarados or Steelix into the park. A Winner Is You: Quoted by a clown in Veilstone when he gives you the Coin Case.